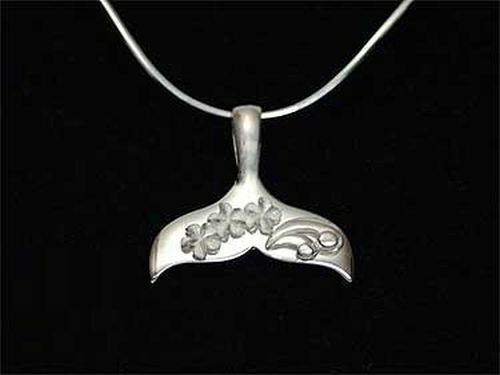 Sterling silver Hawaiian jewelry design whale tail, highly polished anti tarnish finish pendant with a hand carved Hawaiian Plumeria (frangipani) leis and 3D waves. All the flowers have a sanded finish with diamond cut petal edges. In Hawaii it is said that whale tails bring good luck. The whale, also known as the kohola, was considered to be a family deity or `aumakua. Hawaiians believed that when a powerful ancestor died, he or she took the animal form of an `aumakua and ever after guided and protected the family. Measurements: 25mm drop, 24mm wide. 3.20 grams weight. Built in chain loop, takes a chain up to 2mm diameter.